Ready…set…hike! Pandora A (Terrier Mix) plays quarterback and barks out the signals. 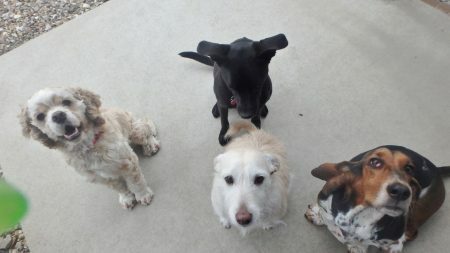 Her teammates, Stanley W (Cocker Spaniel), Pippi A (Terrier Mix), and Shaker H (Basset Hound), are focused and ready for action. What should the JDPC football team mascot be? So many great breeds and mixes are represented on a daily basis, it is hard to choose. Got it…we’ll be Just Dogs! Go Dogs! !